If you are getting here from Jessica's blog then you are right on track. If you are just finding your way to our fun filled, extra caffeinated, and mega inspiring blog hop, then please start at the beginning here: Freshly Brewed Challenges. Rubber Stamps: Hello Girlfriend and You+Me=BFF. For this hop weekend only you have the chance to purchase both stamps at an extra special deal! 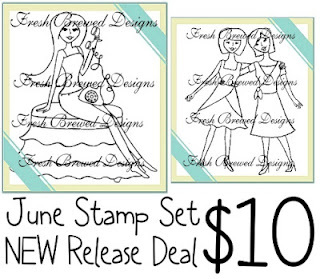 You can get both stamps for $10!!! **BONUS!!! ** one lucky person who purchases this set will also receive some extra goodies in their package! Stop by the shop to see what you could win!!! old and new for all of your lovely comments! I really do appreciate all of you! blog candy to two lucky followers! 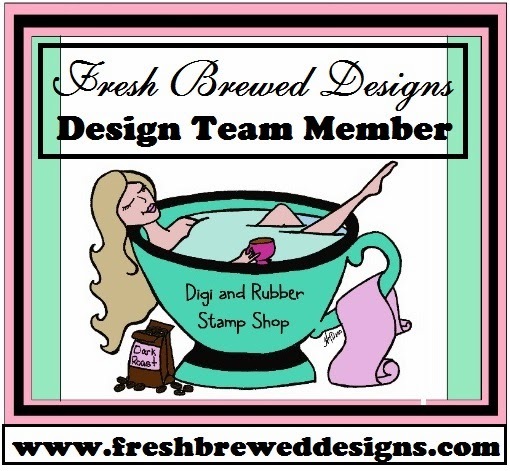 You can use this gift certificate toward rubber stamps or digi's! Remember that this Hop lasts for 3 days! You will have until Monday to Hop! Good luck and don't forget to leave a comment! Here's a complete list of all the participating blogs in today's hop - be sure to hit every stop! You really don't want to miss out!!! Now hop on over to Celeste's lovely blog! Sheryl: http://butterflykisscards.blogspot.com/ you are here! This card is gorgeous!!! You are just amazing with your embellishments. I could never even begin to start a card as detailed and decorated as this one. Mine would look like my craft room threw up on it ;) You have a gift for it, that's for sure. I wont get all sappy, but know how much you are appreciated and that we love you to pieces. You always make me smile and are always encouraging me even and uplifting me when you should be the one receiving the love and care. Praying for you and sending you many hugs! Oh WOW such a beautiful card. I love everything about it. Such a pretty color palette and gorgeous embellishing...lovely card! Sheryl, this is a beautiful card. Love the pinks and greens together. Gorgeous job on coloring and piecing your image. Love all those trims, too. Happy to be in the hop with you! Oh, Sheryl, I love, love , love the embellishments you used and the way they were used. Your card is sooo cute. I am an embellishment addict. (Is there a 12 step program for that you think?) Anyway, I am a follower. Love your work and your blog. Come visit me on my blog. wow!!! so many beautiful embellishments in lovely colors, but this rubber stamp still remains the focal point= perfectly gorgeous! looooove this Sheryl!! have a happy weekeend. Oh my goodness Sheryl, this card is absolutely stunning!! I love all your girlie embellies!! Beautiful! Wonderful embellishing on the bee-utiful card. WOWZERS!!! Your card is simple DIVINE!!! Love all the embellies!!!! Wow! This is incredible! I love the layers and all the bling! What an awesome color combo. Cute image and wonderful coloring. Great work. Gorgeous card Sheryl!Loving your colours and those gorgeous embellishments! Love the colour combo Sheryl, and such a girly girl image, she is wonderful..love all the details, so pretty. Absolutely love this card you definitely can't go wrong with this awesome color combo! Wonderful! Fantastic job on your image (as usual)and more fun embellies. I really like the little bird cage. :-) Thank you so much for all the sweet comments you leave me on my blog. Hope you're having a fabulous weekend! Hugs! Fun new images and your card really shows off this one. Cool corner embee and all the pretty flowers are wonderful...but my favorite part is the stool she is sitting on - I want it! Very pretty and fun creation for the blog hop! Hi Sheryl, thanks for all the ideas on the Bday party... you have given me a lot to think about. I have already made up a cd of the latest music, put Cam's picture on the front of the disc along with the girls names all printed on it around the outside... just now trying to decide on decos... picking up the same colors from the card I made is a great idea. Thanks for stopping buy... Love teh layout of your card.. and of course the colours are fab. This is gorgeous Sheryl. Great details. Thank you so much for joining us at Craft Your Day's Away this fortnight and good luck. Fabulous card ! Love all your datails and your colors. Very pretty. Love how all the embellishments came together. Beautiful design. Thanks for being so kind when you stop by my blog. Oh this is so pretty! I love your design and all the gorgeous embellishments. You showcased this new image to perfection. I really like the vibe of this card! Great touches with the flourish and bird cage elements, and the metal corner is wonderful! So pretty & fantastical. Oh, this is such a pretty card Sheryl! Love the added touch w/the bird cage! Fabulous card! Thanks so much for joining our challenge at Little Miss Muffet!